We have been ‘Packing for a Purpose’ accidentally for a few years now. We have always be against giving sweets or toys directly to street children so on previous trip to India, we have taken pens, soaps and shampoos to distribute to the children we met and we also raised money before one trip for a schools-project that educates slum children (and then were lucky enough to visit the project over there). 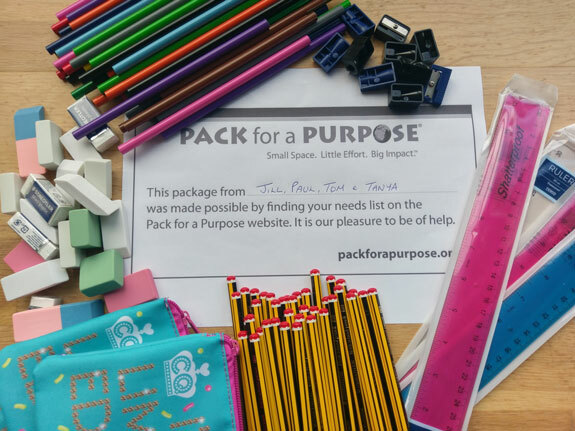 So when planning our recent trip to South Africa, I was delighted when I stumbled upon Pack for a Purpose as it fits perfectly with our ethos of helping local communities. I was even more delighted to find that our first hotel on the trip, Spier in Stellenbosch, collects items for three different local projects. We decided to save space in our luggage to help the Windmeul Primary School by purchasing a range of school equipment. Whilst we didn’t have masses of spare room in our cases, we hope that our small contribution will be useful to these children. We will also be checking on the website to Pack for a Purpose on future trips.